About 55 minutes south of Cancun, 20 minutes south of PDC. Refer to the Map. What is included with my “All Inclusive” vacation ? Breakfast and lunch in buffet style. Dinner in the buffet or in one of our A la Carte restaurants (unlimited dinners, based on the availability), Snacks 24 hours in the Bar Punta Emilia (Grand Palladium White Sand) and Beach Bar (Grand Palladium Colonial), local and international drinks with or without alcohol (also included in the discotheque), house wine in all of our restaurants and bars, cocktails and selection of international drinks of “Premium” quality in the Bars Hemingway and Churchill. Sports and animation included, according to the activity, gym according to service desired, towels, turbines and umbrellas for beach and the swimming pools, miniclub, Black & White Junior Club, minibar in all rooms (restocked daily). Free room service (Grand Palladium from 11 am to 11 pm, Royal Suite 24 hours) SERVICE OF ALCOHOLIC DRINKS PROHIBITED FOR MINORS LESS THAN 18 YEARS OF AGE. What kinds of rooms are available? 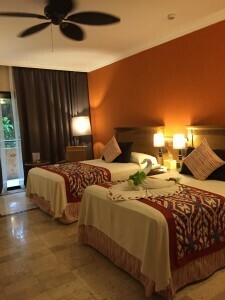 Standard (one king bed or two doubles), Jr. Suite (same as standard with pullout couch in sitting area), Presidential Suites, Mayan suites/Cabanas (see below). Jr. suites & suites. Limited number of family suites. (Connecting suite & Jr. suite). 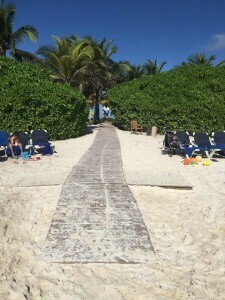 In the White Sand & there are also some Cabanas. Can a room accommodate five people? Yes in some Jr. suites or a suite and a connecting Jr. suite (White Sand). Some companies will allocate a certain amount of these rooms for families and the rest just for two people but the rooms are exactly the same. Not all tour operators will work in the same way as this is their own criteria. Is smoking permitted in the rooms ? What amenities do the rooms contain? Self-programmable safe, hair-dryer, mini-fridge with water, soda & beer-(Stocked daily), satellite TV, Iron, ironing board, tubs, shower, A/C with card access, iPod dock. 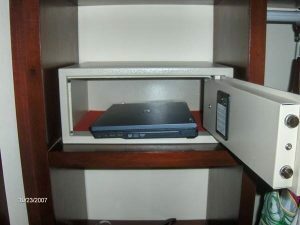 The safes in TRS Yucatan measure 13 1/2” or 34 cm wide, 12 3/4” or 32.5 cm deep, 5 1/2” or 14.5 cm high. 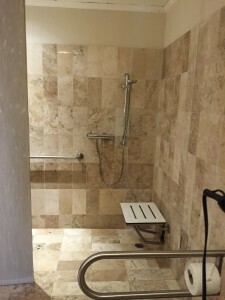 Does the resort offer accessible rooms ? Yes, The Palladium hotel group strives to offer a luxury vacation for all. Does the resort offer beach towels? Yes, each guest will be given a beach towel which can be exchanged for a clean one. Towel exchange locations are located at Colonial, White Sands Pool, La Jarra Kantenah beach bar and La Rocas salt water pool, El Rinconcito Pool, the Adult pool in White Sand, and the Royal Yucatan Suites Pools. The towel huts are open from 8am to 8pm in the summer and 8am t0 6pm in the winter months. Towel cards are no longer used. Air conditioning setting FYI: Depending on what temp you want suggest as an example: set to enfriamiento and auto and 22c = 74F (use up and down arrows) and hit set. Check in is at 3pm and check out is at noon. Late check out can be arranged through the desk based on availability ($10 per hr.). 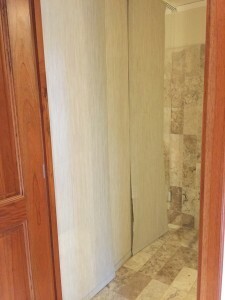 There are courtesy rooms available for showering and changing for no additional charge. What is the electrical voltage? Image of the power receptacle. The AC and electricity in the room is activated through the use of a room card key. In order to conserve energy, the electricity goes off when you remove your room key and leave the premises. The AC also goes off if you open your slider door. Doug UK suggests: A useful tip for European travellers. The sockets in the rooms also support 2 round pin plugs but NOT UK plugs. Infact the clock radio in the room has a 2 pin round plug. 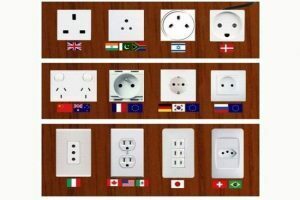 Here is a handy chart showing each outlet from different countries. Thank you Juan J Mullin. 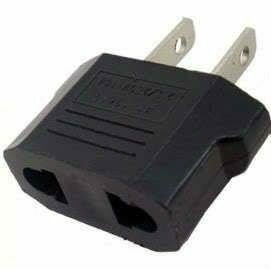 An adapter some travel with. 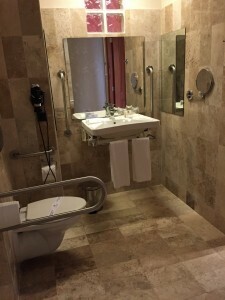 (image below) It has been reported that the UK round pin will not fit in the the receptacles at the Riviera Maya Complex other than the one in the bathroom. Can I take a taxi from the resort ? 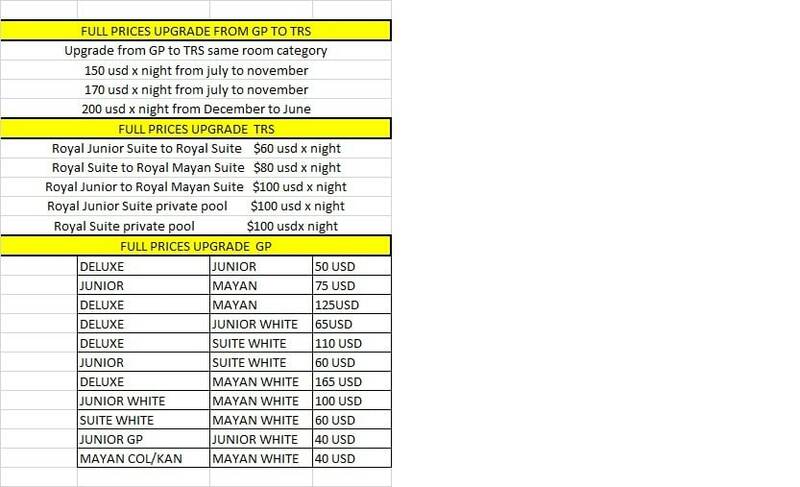 Yes, here are the rates from the resort to various places in the Riviera Maya. What are the laundry services? The hotel provides next day laundry/pressing/dry cleaning services. However, this is charged per item per service, i.e. washing one cost, pressing another. It is advisable to pack accordingly or to use the Laundromat in Akumal. There is a phone connection fee of $5 for ALL calls from your room (including 800 #s). It is advisable to buy a phone card in the lobby for use with the phones there, buy a Ladatel phone card in town or use your cell. Some cells do work in the area including Verizon and AT&T but you must have it activated at home before you leave. Are there English television channels ? Yes, there is a good variety of channels. The free WiFi speed will be .5Mbps 512 kbps in the rooms, lobbies, bars etc. for basic emails, Skype. When staying at the TRS Yucatan, where can I find my butler ? You will find your butler in each villa. If they are on a break you can go to the TRS Yucatan lobby for assistance. What can my butler do ? Your butler is there to help with any arrangements you may need to make. They will make dinner reservations, Chic, reservations, errands, unpack, book spa appointments, arrange a taxi or tour, they can help with most anything. Is there a photographer on-site? You may change your currency for pesos at the front desk 24 hour per day. You will get a better rate at one of the two ATMs. To change currency or larger bills at the front desk you’ll need your passport. Sometimes the bellboys or bartenders can make change.Note: All services at the hotel require payment in pesos. There are two ATMs, one is located in the Kantenah lobby and dispenses Pesos, the other is located in the Colonial lobby and dispenses USD.  What is the weather ? Is there a departure tax payable when travelling to Mexico ? Most of the time this airport tax is included in the price of your ticket. Please check with your airline or check your airline ticket to make sure the tax is included. Depending on the exchange the tax is around $48.00 USD per person. Thomson passengers pay it for each ticket holder. Departure tax of approx. 900 Mexican Pesos – approx. £45, $65 or €48 – payable locally in cash only. Scottish and Irish pounds, travellers’ cheques, credit and debit cards are not accepted. This is controlled locally, and may be changed without notice. What does the resort do in case of severe weather such as a hurricane ? In case of an alarm, the resort has shelters available. Executive personnel and hotel management will inform guests of the measures and procedures established. Detailed information will be provided through channel 2 on your TV. What if a power failure occurs ? In case of emergency, the resort has its own back-up power generators. There is a doctor on site 24 hours per day. There is a flat fee for a doctor visit and additional fee if other services/prescriptions are needed. The hotel is part of an organization called HOSPITEN which is affiliated with a state of the art hospital in PDC and Cancun. Does the resort have a defibrillator onsite ? Yes, there is 1 located at the Colonial and 1 at the Riviera. What are the differences between the resorts? Some room difference. . Guests can use amenities for all resorts except the Royal Suites Yucatan which is for those guests only. The buffets are the same and amenities are equi-distance. The new sides have bridges not found on the C/K side. Presidential Suites: For TC Guests. Colonial/Kantenah Jr. Suites, Suites & Romance Bungalow have a hydro-massage tub or a shower/tub combo. White Sand have real jacuzzi and not hydro massage. Villas/Jr. Suites (White Sand): 52, 53, 54,56,57,58, 59. Romance Bungalow/Cabanas (White Sand): 5501-2, 5503-4, 5505-6, 5507-8, 5509-10, 5511-12. There are two types of bathrooms in these Jr. suite rooms; separate, enclosed and an open” concept with a Jacuzzi in the room. The Jr. suites in White Sand buildings 52-54 have the open concept, cabanas in 55 have separate bath with outdoor shower. 56 – 59 have separate enclosed bathrooms. There is an adult only exclusive area at “TRS Yucatan”.61,62,63,64,65,66,67,68, 69, 70, 71, 72. The Royal Suites Yucatan (TRS) consists of 11 buildings of Jr. Suites , Suites, Swimp up, and Master Suites some with a double jacuzzi by the terrace. The Jr. suites have the “open” bathroom concept. The Mayan Suites are located in The Royal Suites Section 72. TRS Yucatan is only for adults. (18+) Only guests staying there or select Travel Club members and VIPs are allowed to use the facilities there. The Romance Bungalow (cabanas) in White Sand & Royal have kayaks included. Junior Suite Double Beds: Sofa Bed. What do the different color bracelets represent ? Red for repeat guests, travel agents & special occasions. Purple for Kantenah, Colonial, White Sand guests. Green for guests under 18. Blue for Travel Club Members, Kantenah, Colonial, White Sand guests. Gold with VIP and Travel Club Logo embossed on them’ for Travel Club Presidential, Presidential Ambassador and Signature level Members. What are the bed dimensions? The beds are the standard double (matrimonial) king Mexican dimensions. Can I make a room request before I leave? Yes, make your requests here. Note: Suites between the resorts are different. The suite’s at the Col/Kan are larger. Size is like two Junior Suites in size. Can I upgrade my room at check in ? All upgrades are subject to availability at time of check in. Standard to Jr. Suite cost $50 USD per room per night for Colonial, Kantenah. Standard (C,K) to Suite in White Sand cost $110 USD per room per night. Jr. Suite to Suite in White Sand cost $60 USD per room per night. Standard (C,K) to Romance Bungalow in White Sand cost $200 USD per room per night. Jr. Suite to Romance Bungalow in White Sand cost $150 USD per room per night. Upgrade to TRS cost $ 150 per room per night depending on which category you have originally reserved. Prices will vary. We suggest booking your preferred choice of room at time of booking whenever possible. Will repeat guests receive any special “benefits”? We have tried to publicize everything that is “official” Repeat guest benefits are not”official”although there are some rough guidelines. Is this your 2nd trip or more? A guest who has been there 2-3 times may get an upgrade if available, may get a fruit basket. There are no guarantees on an upgrade. A guest who has been there 4+ times may get the above in addition to 3 a la carte reservations if they choose. Guests who have been 8 or more times (RM), 10 or more times (PC) may get a gold bracelet which entitles them to unlimited a la carte reservations and access to TRS. They also have the spa fee waived. Gold bracelets are given at management’s discretion. None of these are cast in stone and there may be additional amenities such as flowers, champagne,etc for an anniversary or other special occasion. We always suggest you book the room you want so there will be no disappointment. Guests may also order special amenities for a cost. Can I purchase the bathrobes ? Yes, you can only buy them at Grand Palladium or Zentropía and have a cost of 60 usd. At the moment they are not selling them at TRS. How does the Smile Services work ? Here are some frequently asked questions and answers regarding Smile Services. Can you tell me more about this new smile service please? Is there a cost ? Who comes up with the idea or plan for the special arrangements ? How far in advance does someone need to contact you? Which resorts are offering this service ? A big thank you goes out to Guillermo Orlando Maldonado Duarte ( Memo) for providing these answers. Where are the Guest Services desks located ? There are 2 Guest Services desks located in the Colonial lobby. What ala Cartes are available? For Poseidon, Sumptuori show table & BBQ – book the day before with guest services. As schedule changes based on resort occupancy; ask when you check in, check bulletin boards or stop by Guest Services for scheduled days. Guests can make the reservations from one day before until the same day before 1:30PM. Offering a fun evening consisting of dinner and a show from 8 pm. Chic is included for TRS Yucatan guests, VIP gold bracelet and PTC members of appropriate membership level(s). Grand Palladium guests may book with guest services, the cost is $100 usd per person. You can go as many times as you want. It is subject to availability and occupation since it is not done every night. Therefore, priority is also given to those who have not assited or guests checking out the next day after the show. PLEASE NOTE : The dress code for TRS restaurants is the same as GP, long pants or dress shorts, shirts with long or short sleeves and also nice sandals are allowed. The butlers are advising the guests about this dress code. What are the dress codes ? Do Men need to wear long pants to ala cartes ? 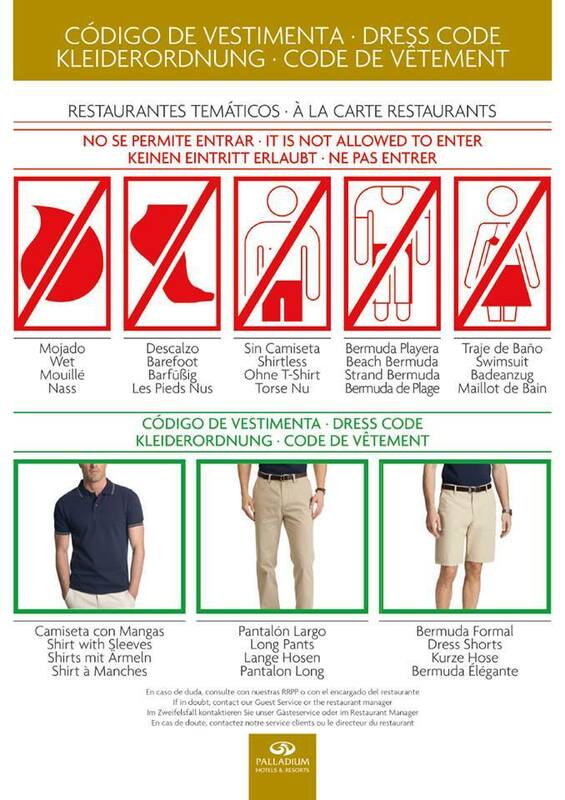 No, Men now enjoy a relaxed dress code in Riviera Maya, Puerto Vallarta and Punta Cana. The exception is in the Chic Theater at TRS which requires men wear long pants. What non-motorized water sports are available? What is the on-site dive shop? Is it a separate company? What does it offer? 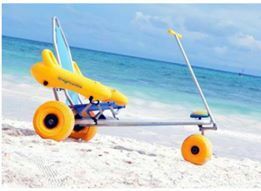 This beach wheel chair is available from the dive center located on the Colonial beach. There is no charge, you must present ID and your room key to sign it out. It is for use only at the beach. Special thanks to Paula for this information. What other non-water sports are available?  Land and water aerobics, pool and beach volleyball, table tennis, dancing lessons, darts, archery, riflery, min-golf, tennis (6 courts), badminton, Spanish lessons. The new multi-purpose sports court offers volleyball, football, basketball, soccer pitch with artificial grass and a mini soccer pitch with artificial grass. Is there a fitness center & Spa? Large Gym with two different areas: one offering a variety of weight lifting machines and the other for aerobics. Lockers and dressing rooms offered. Sauna, Jacuzzi, Steam Bath. The exquisite marble spa is huge and is probably one of the most spectacular spas in Mexico. There is a $50 per day fee except for Royal guests or those paying for services.The spa features winding pools, whirlpools, 17 indoor massage cabins, outdoor massage cabins (great for midnight massages), Spa treatments available for an additional charge at Zentropia Spa. Different cosmetic treatments and massages, Hairdresser, Eco Meditation, Temascal ‘Mayan Sauna,’ Foot bath, Cold bath and Balinese Bath. Is there a kids club? Ages? Yes, enclosed Club near the pool and main beach. Kids 1¬12 are welcome from 9am – 11 pm daily. There is a new kids water park near the kids club for ages 4-16. There is also a shallow kiddy pool. Kids eco-tours of the resort are included. Evening programs begin in the Theater for kids at 8 pm. Wednesday morning Breakfast with Raggs is not to be missed. Must be booked. There is a Black and White Junior Club for teens located at the old Spa site in Kantenah with age appropriate activites and a Wed. night dinner. What languages are spoken at the kids club ? ” The baby sitting service that we have at the resort, has to be requested one day in advance, and has a cost of 15 usd for per child per hour. Is it possible to rent a baby stroller, car seat? What is there to do if we have a rainy day ? Is there a sport’s bar? Yes, the sports bar is off the Colonial lobby and shows major sports events. It also serves food in the evening. The Sports Bar is currently opened 24 hours per day. Yo must have on dry clothing and footwear to enter the sports bar. Yes. The water is purified several times via an osmosis purification system and is safe. Bottled water is provided in the mini-fridges. Does the resort offer a Catholic Mass? Yes, located next to the Colonial lobby in the church, La Iglesia De Nuestra Senora De Las Nieves on Sunday at 11 am. Masses are added at Christmas & Easter. Does the Resort Provide Day passes? You do not need to pre-book, upon arrival ask at front desk. What is there for kids to do ? The Palladium Hotel Group has implemented a wonderful family program. There is something for children of all ages to do, please refer to our Palladium Kids Page for more details. What is Imperial Club ? Imperial Club is a offered exclusively to those who book an Imperial Club room with Transat Holidays. Here is a list of some of the included perks that come with this. Premium brand drinks; Separate check in at club desk; Distinct identification bracelet; Welcome gift and letter; Fruit basket upon arrival; Concierge service; Private cocktail party. Please refer to Transats website for a full list and any changes that may occur. You must have a current passport to enter Mexico. Minors travelling alone need authorisation from parents or guardians and signed by a notary. Andorra, Argentina, Australia, Austria, Belgium, Canada, Cyprus, Czech Republic, Denmark Estonia, Finland, France, Germany, Greece, Hong Kong, Hungary, Ireland, Iceland, Israel, Italy, Japan, Latvia, Liechtenstein, Lithuania, Luxembourg, Malta, Monaco, the Netherlands, New Zealand, Norway, Poland, Portugal, San Marino, Singapore, Slovakia, Slovenia, South Korea, Spain, Sweden. Switzerland, United Kingdom, Uruguay, USA, Venezuela.The remaining countries require a visa, which can be obtained from the Mexican embassy in those countries. The official currency is the Mexican peso, although US dollars are accepted in most of the country. Hospitals are private; therefore, it is recommended to take out travel insurance. According to the Ministry of Health in Mexico and all other countries, no specific vaccinations are required to enter the country. The tropical climate means that there are a great many insects, so it is recommended to take insect repellent and be vaccinated against hepatitis A and B.Precautions must be taken with drinking water and bottled mineral water is recommended. If you have any questions please feel free to ask on our forum.